I completed the doily with the flower border. I really love this pattern. So pretty. I have no doubt I shall be tatting this again in the future. I made holes along my drawn oval (the bits of blue you can see on the edge is the marker I used which is water soluble so will wash away eventually but can still be seen a bit) and then used a crochet and the same green thread to attach the border into the holes I made with my machine. I then folded the extra fabric on the back. The decorative pink stitch keeps the folded edge in place. I used a variegated Sulky which I thought would go well with the colours of the flowers. But a plain, bold pink or green (or yellow or orange for that matter!) would have looked good too. I found a pretty fabric that has a subtle cream on cream motif through it. 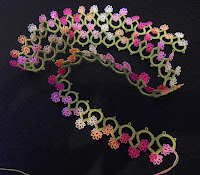 When I last made this edging, it was from another book and the flowers were larger: there were 2 ds between each picot as opposed to just one as here. And the "stalks" were longer (I shortened them here by choice). Both ways look nice. Here's one last photo on a dark background. I think it really brings out the brightness of the flowers. I love that, it looks fantastic, congratulations. 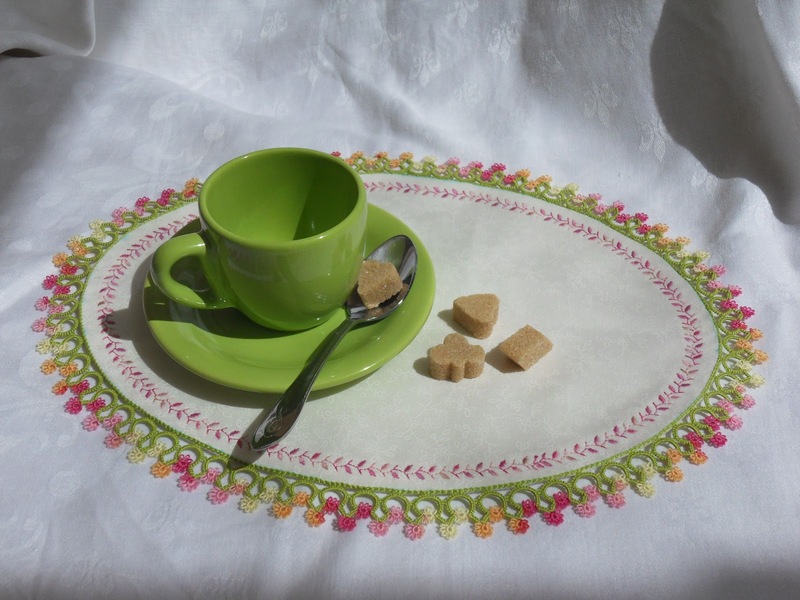 very pretty edging, and very pretty embroidery, all put together this is a gorgeous package. Beautiful! I love the way the colors in the edging are reflected in the embroidery. Love it - but what’s not to love in green and pink with a bit of orange? So pretty! Absolutely beautiful, I am envious of this piece! So so pretty, great job :)! Your work, as always, is perfect! I can't imagine that my curved hem would have turned out so well! This is also a great way to use those fancy embroidery stitches on a machine. 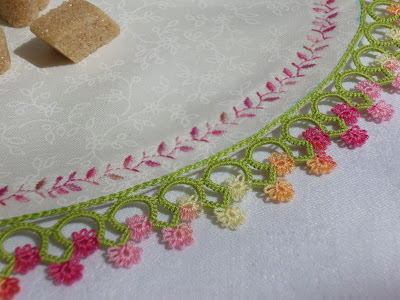 And the beautiful tatting is enhanced by the crocheted stitches. Wonderful photos! 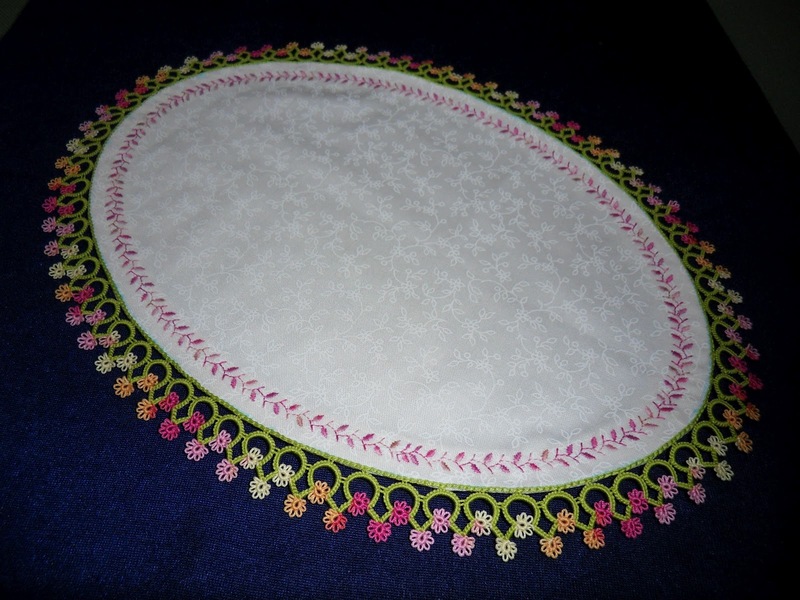 I would not get tired of this beautiful edging - it is just perfect on the oval doily with matching embroidery. I love this pattern too! Really pretty, so bright and cheerful...it just makes one happy to look at it! Wow, I love it! So delicate, so pretty. Stunningly beautiful, I love the edging it's so pretty and looks and compliments the doily so well, well done on a beautiful piece of tatting. It is very beautiful! Love the patterb. Another truly gorgeous piece, the colors are lovely! Saw this on InTatters and loved it. This is a real showstopper. Excellent! Love the colors. Where might I find the pattern? Hi Margaret, it's a vintage border which I have seen in more than one old book. But this particular one (there are slight variations) is from The Tatter's Treasure Chest. Do you have the book? I first saw this edging many years ago in a book displaying antiques and thought it was gorgeous. I counted every stitch to make it and have loved it ever since. And you changed my mind about thread colors. I am one who did not care for orange with pink and/or red. But your edging is just like a flower garden. I just bought the same thread to try. My color prejudice is gone! Both the pattern and the colors are perfect! I have looked through the book and the only pattern that looks like yours is on page 72 and is called "empress". Am I correct? Yours is so much prettier that the book's. I like how you have revised it and the colors you used are perfect. Hi Tatting-Marie, yes that's correct, it's Empress. I think my tension is a bit tighter than the edging in the book (you can see the bottom on theirs is flat, whereas the chain should be curved) - I have also shortened the "stalks" of the flowers from 6 double stitches to 4. Thank you for the comment! I'm glad you like it. This is so beautiful. I wish you could teach me to make this. :) Lovely work.